Please take this opportunity to join Alexandra Jackson, manager of the Rathbone UK Opportunities Fund, on Thursday 9 May, at 10.30am for our live webcast. Markets, even the UK, have climbed the wall of worry and rallied hard so far in 2019. With the Rathbone UK Opportunities Fund up over 14% year to date (to 23.04.19), we ask manager Alexandra Jackson where to from here. Put your questions to Alexandra in advance or during the call using the 'questions' tab at the top of the video screen. A recording will be available 'on demand' after the call if you are unable to join us at 10.30am. Please take this opportunity to join Bryn Jones, Rathbones Head of Fixed Income and manager of the Rathbone Strategic and Ethical Bond Funds, on Thursday 2 May, at 10.30am for an insight into why now is the time to be using the Rathbone Strategic Bond Fund. Bryn will be discussing how he navigates the bond market to protect investor capital and ensure consistency of returns through periods of extended volatility. Put your questions to Bryn in advance or during the call using the 'questions' tab at the top of the video screen. A recording will be available 'on demand' after the call if you are unable to join us at 10.30am. As we approach the Brexit deadline day, Will McIntosh-Whyte discusses why the Multi-Asset team are not looking to take big bets on the outcome, but rather position the portfolios in order to minimise any downside risk whatever the outcome. Please take this opportunity to join Bryn Jones, Rathbones Head of Fixed Income and manager of the Rathbone Ethical Bond Fund and Rathbone Strategic Bond Fund, on Thursday 14th March, at 10.30am for our live webcast. 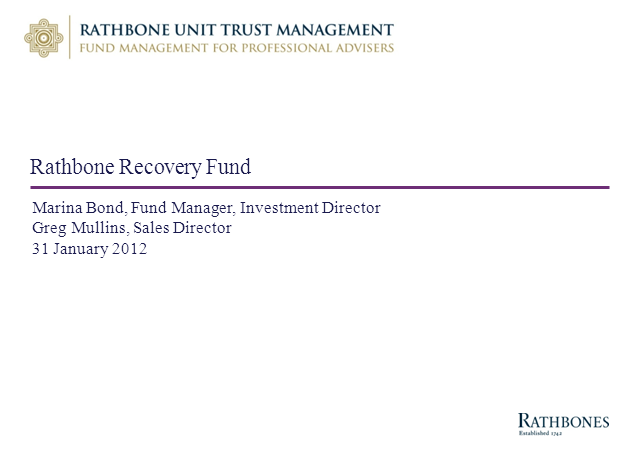 This webcast will focus on the Rathbone Ethical Bond Fund. Bryn will be discussing the current themes occupying the fixed income space, from inflation to Brexit and also a focus on where we currently sit within the economic cycle. We will also take a look at some notable funds and credits, how these fit within the portfolio and the narrative behind them. Please take this opportunity to join David Coombs, Head of Rathbone Multi-Asset Investments on Tuesday 26 February, at 2:30pm for our live webcast. David will update investors on the latest approach to the car crash that is Brexit and the accident waiting to happen – Europe. More positively David will cover areas where he feels more confident such as health, e-commerce and entertainment. Put your questions to David in advance or during the call using the 'questions' tab at the top of the video screen. If you are unable to join us at 2:30pm a recording will be available 'on demand' after the call. Please join Rathbone Income Fund managers, Carl Stick and Alan Dobbie on Thursday 14th February at 10.30am for our live webcast. They will review performance of the Rathbone Income Fund in 2018. As well as discussing the strategy and positioning of the fund; looking ahead and considering where opportunities for long term performance may be found in the current landscape. Put your questions to Carl and Alan in advance or during the call using the 'questions' tab at the top of the video screen. If you are unable to join us at 10:30am a recording will be available 'on demand' after the call. Policy tightening is meeting slower economic growth, a trade war and widespread displeasure with ineffective political solutions. The good news is that investors, sensitive to the complacency that defined the pre-Lehman years, may have overly discounted the slowdown....assuming it will be as toxic as the 2008 crisis. As the storm rages on, James Thomson will discuss how the Rathbone Global Opportunities fund is positioned, key drivers of recent performance, and the likely opportunities and dangers of the year ahead. Put your questions to James in advance or during the call using the 'questions' tab at the top of the video screen. If you are unable to join us at 10:00am a recording will be available 'on demand' after the call. What is the outlook for markets in 2019, is there a chance that the US will enter recession and how quickly will the Chinese economy slow? Join Julian Chillingworth, Rathbones' Chief Investment Officer as he discusses Rathbones' house views for 2019 against a backdrop of unprecedented uncertainty. Put your questions to Julian in advance or during the call using the 'questions' tab at the top of the video screen. If you are unable to join us at 2:30pm a recording will be available 'on demand' after the call. Equity and credit markets exacted their pound of flesh from investors in the last quarter of 2018, as concerns over global growth mounted in the face of tariff wars and rising interest rates. Assistant fund manager Will McIntosh-Whyte discusses the outlook for 2019 and the risks that sterling might pose for investors as Brexit unfolds. This is an opportunity to join Bryn Jones, Rathbones Head of Fixed Income and manager of the Rathbone Ethical Bond Fund and Rathbone Strategic Bond Fund, on 13th December at 11am for our live webcast. We will focus on the Strategic Bond Fund. Bryn will be discussing how the Rathbone Strategic Bond Fund navigates fixed income and multi-asset through periods of volatility. We will also provide further detail on some of the Fund’s key components, including the volatility, sharpe ratio and correlation figures. Put your questions to Bryn in advance or during the call using the 'questions' tab at the top of the video screen. A recording will be available 'on demand' after the call if you are unable to join us at 11am. Investors have done a lot of clambering up ladders only to slide down more than a few snakes this year. Assistant fund manager Will McIntosh-Whyte discusses how the US Federal Reserve and G-20 leaders have been playing the game recently and how the dice may land in 2019. He also takes a look at how the multi-asset portfolios have performed this year and how they are positioned for the next. Investing in the UK is at the very bottom of the list for global asset allocators. Is there something fundamentally wrong with UK-listed businesses or is this a case of Brexit-induced pessimism? Join fund manager Alexandra Jackson to discuss where the opportunities are in this overlooked market. The simplest solution tends to be the most likely answer. Following early October’s tumble, many different theories for the equity market fall have been thrown around. Join assistant fund manager Will McIntosh-Whyte as he argues you can follow a logical path back to a hefty jump in US Treasury yields stemming from the Federal Reserve’s declaration that interest rates are “a long way from neutral”, and discusses how the multi-asset portfolios have behaved through the recent market volatility. Please join Fund Manager, Carl Stick on Wednesday 19th September at 11am for our live webcast. Carl will review performance of the Rathbone Income Fund in 2018. He will also discuss the strategy and positioning of the fund looking ahead and consider where opportunities for long term performance may be found in the current landscape. With all the noise in the US markets dominated by the big 5 FAANG stocks; what is happening in the rest of the market and how is the rest of the US economy performing? The FAANG stocks have become significant weightings in the US indices and been a big driver of the positive returns posted this year to date. However there is life elsewhere in the US. David Coombs, Head of Multi-Asset at Rathbones will highlight the other areas that are seeing good growth that are below the radar; also covering how he is positioning his Multi-Asset funds to maximise these growth areas. You can put your questions to David in advance or during the call using the ‘questions’ tab at the top of the video screen. James Thomson, manager of the Rathbone Global Opportunities fund will discuss the drivers of top quartile performance in 2018* including the zero exposure to emerging markets, declining UK and overweight US, tech and defensive growth. He will also address the vulnerabilities of his strategy and highest conviction themes. The US President has spent most of the year sending ill-advised tweets from the back of the classroom, but his boisterous optimism and background deregulation has pushed the US market to new highs. His politics may be questionable, but it’s businesses we focus on. Join assistant fund manager Will McIntosh-Whyte as he assesses the economic prospects as the mid-term elections approach, and runs through a report card of what has worked for the funds and what hasn’t. Will looks at the implications of recent developments in Italian politics, and discusses how the multi-asset funds are positioned. Global investors are as pessimistic about the UK as they were during the financial crisis. But with exploding M&A, appealing valuations and plenty of growth, can we really afford to ignore the UK market anymore? Take this opportunity to join Alexandra Jackson, manager of the Rathbone UK Opportunities Fund, to explore the outlook for the UK market and how the fund is positioned. Stay up to date with our fund reviews as a selection of our fund managers discuss market trends, their strategy and the challenges and opportunities that lie ahead.